NEVADA, USA – It has been an exciting time here at St. Paul’s since losing our lease at the church we called home for eight years last September. As you recall September of 2014 we were given our 30 day notice to vacate our church. It was quite shocking to say the least for our congregation. We were angry, sad, defeated and a whole bunch of other emotions, but most of all scared. You see, we were a good church. We all showed up on Sunday and praised and worshiped God, but we were a little lost. We had gotten complacent and comfortable. We all said we had faith, but this truly put it to the test. When we had gotten our 30 day notice we had already committed to hosting our fall Diocese Clergy Retreat and the Patriarch would also be in attendance. This meant our retreat started on the 25th, ended on the 27th, and we had to be out on the 30th. Although scary, it ended up being our faith that let [led] us out of very uncertain future. [How about the working on the part of the H.S., in my mind that was a very large part of the story] As our hearts changed more and more, God’s blessing blew on us more and more in a mighty anointing with success we can now barely contain. We have been in our new home for six month. When we finally listened to God, he led us on a journey none of us were ever expecting. 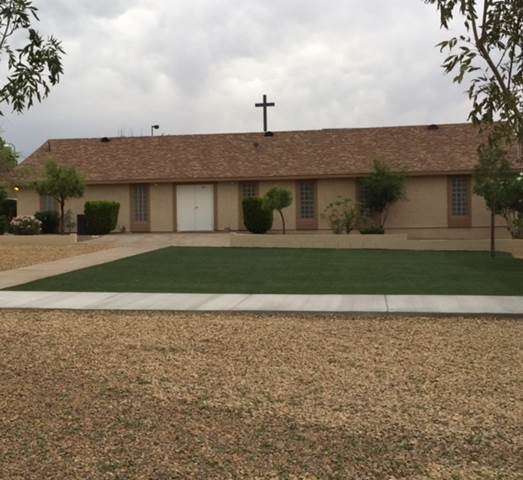 In short, we were able to purchase (for cash) and remodel our own church, which sits on an acre of land. As Bishop Kessler said, “we are no longer beholden to any other Lord (landlord) but our own Lord.” It sits next to a low income apartment complex that God has called us to minister too. We have seen our Sunday attendance go from an average of 46 per week to 82. We have had several services where we had over 100 people in attendance. We truly have a revival going on. June is really shaping up to be an exciting month here at St. Paul’s. Since our move we have just been on fire. This month we have had a back drop wall built with a 13 foot steel cross placed in the ground in front of our Parish Hall. Two of our parishioners commissioned the wall and cross to be built. We have installed a light on it so it shines in the community all night. We have been able to save enough money and finish our landscaping project this month including spreading 102 tons of rock on our land. We are having our first wedding in our new building on June 27th. This is a couple who is new to our church since the move. Very exciting. We have restarted our youth group. We have been averaging about 25 children attending on a bi weekly basis. Most are coming over from the low income housing project next door. We have two Baptisms scheduled for June 17th. Bishop Kessler is coming for a visit on June 28th. During his visit his is going to be baptizing another three children. That will be a total of five Baptisms this month. That is three more than we did all of last year. Bishop will also be receiving seven new members into the church. I want to stress that my biggest lesson learned was not to worry about or listening to what I want, or what other people wanted, but what God wants. It is amazing to see the miracles happen if we get out of our own minds and just submit. Please keep us in prayer, that we may continue to listen to God’s will and grow His kingdom.